Grade One Student – Stronger than Cancer! After 1 175 days of chemo, St. John School is thrilled to announce that brave Nicky Steinke is done his treatment and is an official Cancer Survivor! Surprised by mom with a bouquet of balloons and a bag full of snacks, Nicky celebrated his win along with school staff, Discovery Early Learning and Care, students and family. Swarmed by his schoolmates with hugs, cards and well wishes, Nicky also celebrated by ringing an old-fashioned school bell three times to mark his huge win and new beginning at school! 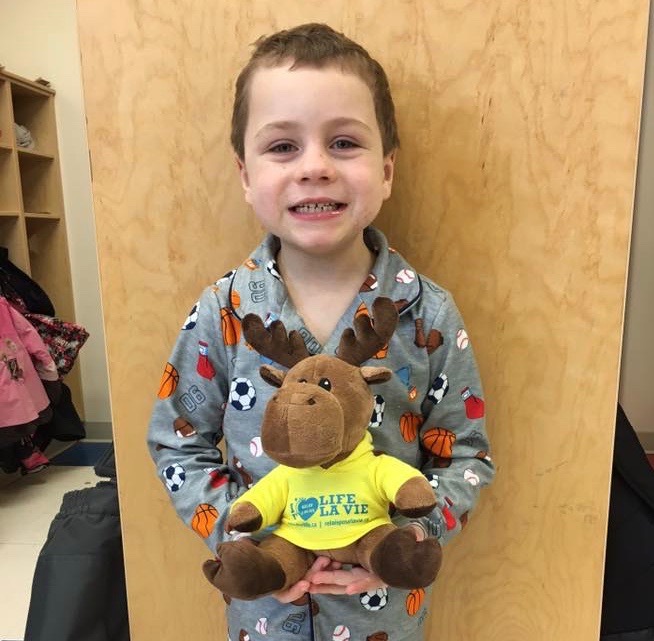 Special guest, Cathy Burns, of the Canadian Cancer Society Sudbury and area, presented Nicky with a stuffed “survivor” animal as well as a baton that he is invited to bring to the Relay for Life 2019 being held at Laurentian University on Friday, June 21st. Congratulations Nicky – we are so proud of you!